The Free Garden TEMP Compost Thermometer is ideally suited for measuring the temperature of your compost. The easy-to-read large 2.5 inch dial and, long stainless steel stem with a pointed tip is the most user friendly compost thermometer in the market. The Free Garden TEMP guides you through the critical temperature range of 80 to 180 degree Fahrenheit to produce the best quality compost. 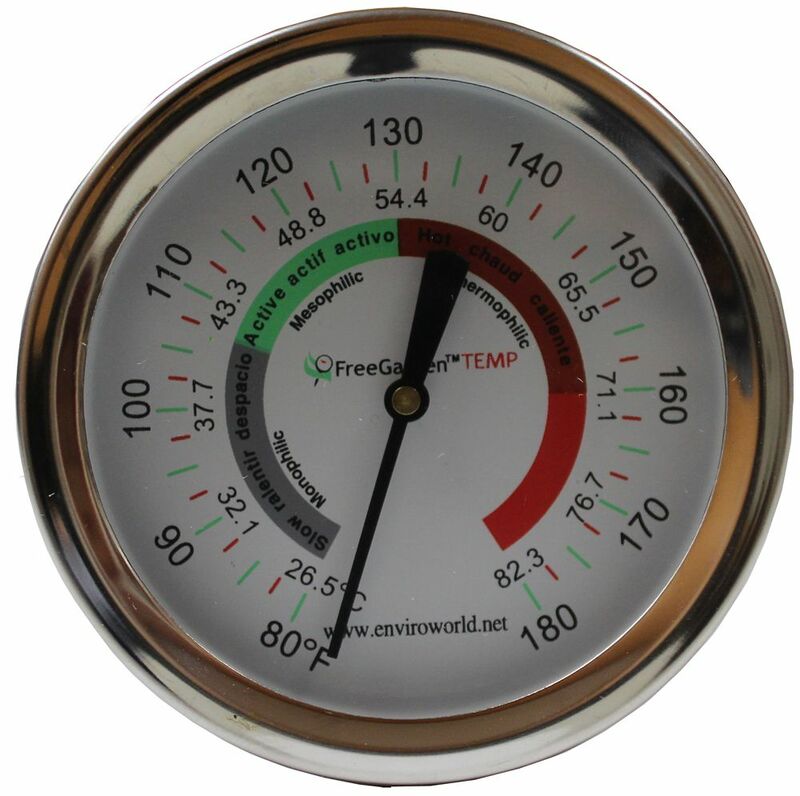 FreeGarden TEMP Compost Thermometer The Free Garden TEMP Compost Thermometer is ideally suited for measuring the temperature of your compost. The easy-to-read large 2.5 inch dial and, long stainless steel stem with a pointed tip is the most user friendly compost thermometer in the market. The Free Garden TEMP guides you through the critical temperature range of 80 to 180 degree Fahrenheit to produce the best quality compost. FreeGarden TEMP Compost Thermometer is rated 3.4 out of 5 by 19. Rated 1 out of 5 by Farmlady from This has never worked. When received, the stem was not properly attached. Plan to return to Home ... This has never worked. When received, the stem was not properly attached. Plan to return to Home Depot locally to see about a refund. Rated 4 out of 5 by Whiterockdoc from Very Functional This thermometer has been helpful maintaining both of my compost boxes, by monitoring their temperature. Rated 4 out of 5 by DJK from This is my 2nd thermometer and both worked very well.... This is my 2nd thermometer and both worked very well. (I accidentally damaged the first when I forgot to remove it prior to turning the compost - oops!) They have a good temperature range, respond reasonably quickly, the color coded ranges allow for quick checks and I liked the long metal sensor. Rated 4 out of 5 by JR from This product works well and no problems with it but I've only had it a short time. My concern is... This product works well and no problems with it but I've only had it a short time. My concern is it doesn't seem as durable as one I already have that cost about the same. I would recommend it and I would buy again. Rated 1 out of 5 by gardenerA from This product did not work and arrived bent, which I think had nothing to do with function. The n... This product did not work and arrived bent, which I think had nothing to do with function. The needle did react to heat and cold and I think that somehow the paper gauge was misaligned with the needle resulting in a dial at rest with the needle on 180. I returned it and got an immediate refund.